I have been drawn to the lotus image for several years now. Someone gave me a bracelet with little silver lotus petals and it came with a lovely explanation about how lotuses are symbolic of “going through” the tough-stuff of life rather than “going around”… something that resonated deeply with me. Lotuses grow through a lot of muck and junk to get all the way to the water’s surface and bloom. The deeper I look into the history, mythology, and meaning associated with the lotus, the more I am intrigued. The lotus seems to neatly tie together several ideas and beliefs I hold dear. The image is commonly used throughout Buddhist and Hindu art. 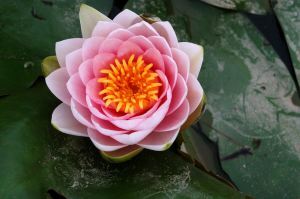 The lotus, not to be mistaken with the water lily, is a strong plant known for it’s beautiful blossom though it grows up from muddy depths (they can grow up to 7 feet “tall” beneath the water, with leaves spanning up to 2 ½ feet!). Its flowers and leaves float atop the surface of the water while the roots are deeply imbedded into the bottom of ponds or rivers. The lotus flower reacts to the sun, opening upon sunrise and closing when darkness descends; it is often thought of as a symbol of death and rebirth. The lotus symbolizes opposites unified: its roots growing from darkness and its bright flower in the clean air above. In the Buddhist tradition, the muddy roots of the lotus are said to represent the suffering found in daily life, the stem represents spiritual growth throughout the lifespan, with the lotus blossom representing the aim of attaining enlightenment. the electromagnetic structure of our consciousness, created by the flow of energy and consciousness located along the main energy channel flowing from the upper brain to the base of the spine, and regulating our physical, mental and emotional states (Redmond, L., 2004). Perhaps it is not so surprising that this system is often portrayed as a series of various-petaled lotuses; the human body like one big lotus with the bloom of enlightenment at the top of our being. It is tempting to appreciate only the delicate flower the lotus is known for and eschew the ugly or hidden roots that are crucial in supporting the blossom and stalk. But this is to fail to acknowledge or take for granted the shadowy roots in life. The blossom and roots are in some ways opposites, but we cannot have one without the other. Looking for ways to appreciate and unify the opposites in ourselves and in our world seems to result in growth… maybe even enlightenment. Life seems to be a lot like the lotus, full of opposites with a need for appreciating disparate realities both in the world around us and in ourselves.